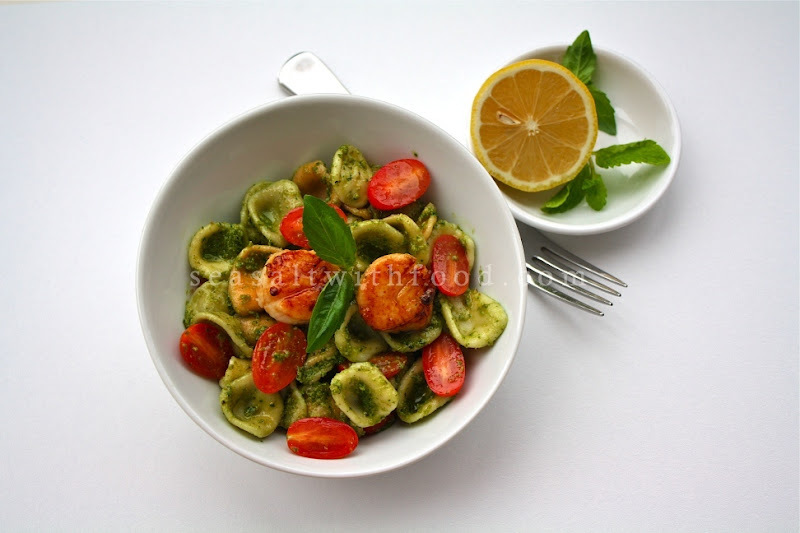 This is Asian Pesto With Orecchiette Pasta and Scallops. You might want to know that there is no cheese and pine nuts in the pesto. 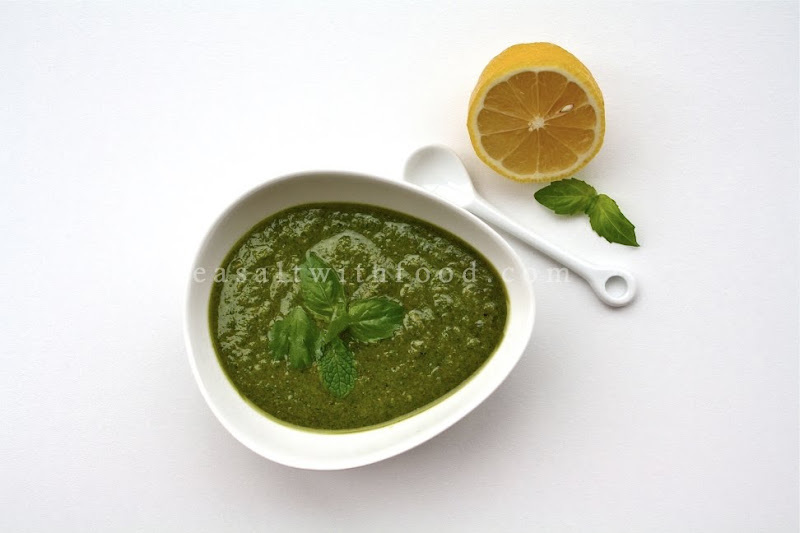 Besides using the pesto with pasta, you can also serve it as a dip with chips or with grilled chicken, which incidentally is another of my favorites. Just lightly season the chicken with pesto before grilling and serve it with salad or as a sandwich. Make the pesto. Combine the garlic, peppers, chilies, basil, cilantro, mint leaves, walnuts, and lemon zest in a food processor or a blender. Process all the ingredients with the oils and season with sea salt and pepper. Sear the scallops in a cast-iron pan that has been heating over a high heat with 1 Tbsp of Olive Oil. Turn scallops once, and remove from heat when scallops are just cooked, about 1 minute per side. 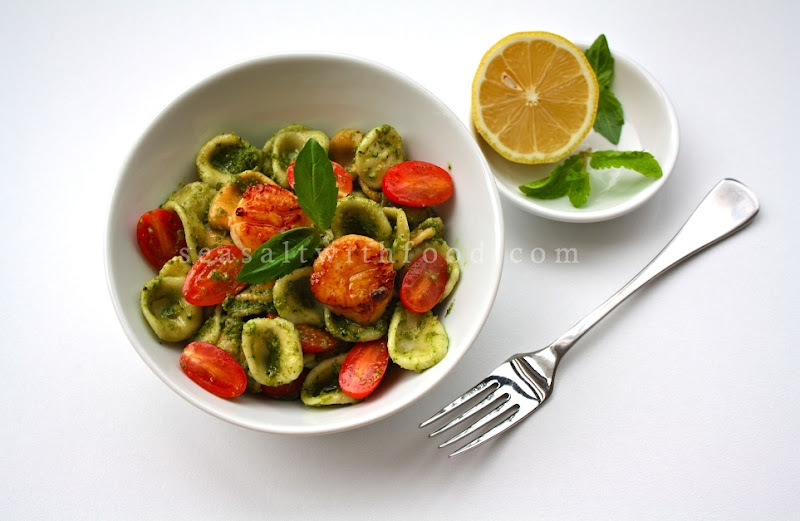 Toss the pasta with ½ of the pesto recipe, tomatoes and lemon juice. Then top with scallops and season with extra black pepper, if desired. Serve immediately. An Asian themed pesto is a great idea! That pesto looks incredible. I am not a big pasta eater, but will be making that for chicken and seafood. Love the sounds of that pesto and can't wait to try it (in the spring when I have basil again!). I never add cheese to my pesto - which I make in batches and freeze in the fall - that way I can decide what type of cuisine it goes into later and add cheese if needed. this looks so beautiful and it sounds amazing! I am obsessed with pesto.. Asian pesto sounds great!. Shall try soon!. I love your pesto recipe. Whoa! Sounds delicious, but super spicy! Fabulous idea - looks great! Can't wait to give it a try. @Shelle : I think Pecan might have a similar consistency. I used the regular sweet basil for this recipe.